The 4% Withdrawal in Bad Times. This article was first posted November 1, 2001. With the S&P500 down about 30% from it's March 2000 high of 1553, many skittish early retirees are wondering if a 4% inflation-adjusted withdrawal is really safe. Of course there have been many 30-year periods where a 4% of assets first-year withdrawal would have grown to 10% or more of assets as the value of a portfolio declined in a bad stock market. Let's look at one such period, the years from 1966 to 1996. Using Yale University Prof. Robert J. Shiller's 1871-2000 stock market database, the worst 30-year pay out period when you use the CPI to measure inflation is 1966-1996. The effect of the steep market decline in 1973-74 and rapid inflation actually made this period worse than the Crash of 1929 and the Great Depression -- at least for retirees taking inflation-adjusted withdrawals from a portfolio. The chart below shows the performance for the "100% safe" initial withdrawal rate of 4.25% of assets for a 30-year pay out period. Retirement withdrawals rose to more than 10% assets well before the half-way mark in 1981 and breeched 20% of the portfolio balance by 1990, six years before the portfolio was depleted in 1996 at the end of the 30-year period. Few retirees would sleep well at night at a 10% withdrawal rate knowing they needed their money to last another 15 years or more -- especially if they understood they were testing the outer limits of these historical "safe withdrawal" studies. If you hold the majority of your retirement assets in an IRA or 401k account, you may be able to improve your retirement withdrawals (and get a better night's sleep) by adding a large helping of TIPS to your portfolio. The chart below shows the same 4.25% of assets initial inflation-adjusted withdrawal rate, but changes the portfolio allocation to 33% S&P500 index fund and 67% thirty-year TIPS. For this analysis, the yield on 30-year TIPS is assumed to be 3.44%. 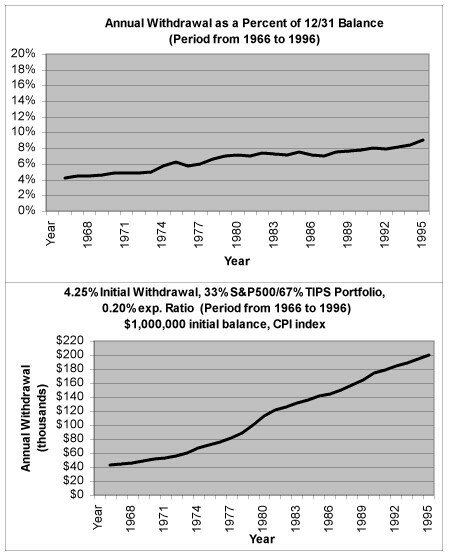 The annual retirement withdrawal never rose above 10% assets in any one year with a portfolio dominated by TIPS. 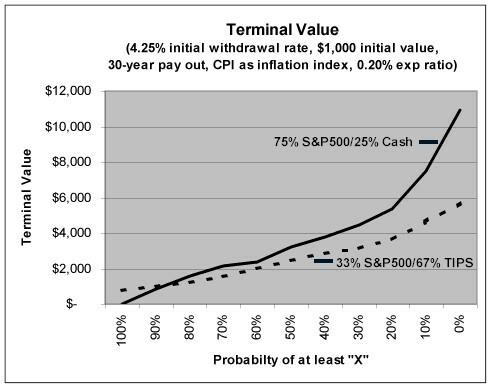 Indeed, the minimum terminal value for a $1,000 portfolio of stock and TIPS was $774. Almost as much as our retiree started with at the beginning of the thirty-year pay out period. Why shouldn't every retiree load up on TIPS? As the chart below shows (based on 1871-2000 historical data), retirees who seek a smoother ride with TIPS will in all probability finish the 30-year period with less money than a neighbor who invests his retirement portfolio predominately in equities. In over 85 out of the 100 thirty-year periods examined, a retiree who maintained a mostly stock portfolio ended up with more money -- in some cases a lot more money -- at the end of the period. TIPS allow a retiree to enjoy a smoother ride at some cost to the terminal value of the portfolio. Retirees in need of a 4% withdrawal (or more) may find this attractive. Retirees who can live comfortably on much less than a 4% withdrawal rate (say 1% to 3% of assets) may want to play the odds and stick with a mostly stock portfolio to maximize its value over time. These flush retirees already enjoy protection against stock market volatility completely depleting their retirement portfolios by virtue of a lower withdrawal rate. Retire Early first looked at adding TIPS to your retirement portfolio back in July 2000 (See, Using Treasury Inflation Protected Securities (TIPS) to increase your safe withdrawal rate.) Back then, the yield on the 30-year TIPS maturing in April 2029 was 3.92%. The yield on the April 2029 bond has since declined to 3.44% at this writing. Even at the lower yield, you can still improve your "100% safe" withdrawal rate by adding TIPS to your portfolio. 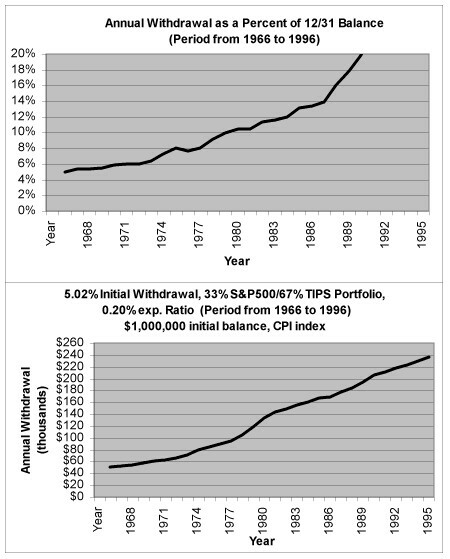 The maximum "100% safe" withdrawal rate for a 33% S&P500/67% TIPS portfolio is 5.02% vs 4.25% for the 75% S&P500/ 25% cash portfolio. That's a 3/4 point improvement. Unfortunately, retirees looking to maximize their withdrawal at the 5.02% level suffer the same 10% of asset withdrawal rates at the mid-way point as we saw in the first chart above for the 75% S&P500/25% cash portfolio. The plot below has about the same shape as the first case and our retiree is unlikely to sleep any better at the 5.02% withdrawal rate. Another concern for retirees using TIPS to reduce volatility or increase withdrawals is reinvestment risk. The 5.02% "100% safe" withdrawal quoted above assumes you rebalance the portfolio each year and are able to buy TIPS at the same 3.44% yield in the future. Of course, there's no gaurantee that you'll be able to do so. You can eliminate this reinvestment risk for a 30-year pay out period by not rebalancing the portfolio, but that reduces the "100 safe" withdrawal rate from 5.02% to 4.80% -- still a marked improvement over the 4.25% withdrawal rate for the 75% S&P500/25% cash portfolio. There's no free lunch in finance. Reducing volatility by purchasing TIPS has a good chance of leaving you with a smaller portfolio at the end of 30 years. That may not be a real concern for a 60 or 70-year-old (How much money are you going to want to spend at age 100? ), but if you are lucky enough to retire at age 30 or 40, you may still want to position your retirement portfolio for future growth in excess of the inflation rate.